Although I had considered retiring my Draenei Mage, Kaprikka, at the Lamplighter Inn in Embaari Village, at the end of Warlords I ultimately decided to pull her back to the Exodar. Ever since I played through the Battle for the Exodar scenario at the beginning of the Light’s Heart questline for the first time with Kamalia — knowing that Kaprikka was there when those terrible things happened there — I can’t bear to log in with Kaprikka. It would feel utterly wrong to be in an Exodar that is calm, peaceful, undisturbed, still filled with the soothing chiming of O’ros, still led by a Velen who is suppressing the ancient brokenness of his heart. A few days ago, Mr Rossi wrote about the trauma experienced by major lore figures and how the in-game and external lore sources deal with it inconsistently. Something the Battle for the Exodar has made me stop and think about is the trauma experienced by the “little guys”, the ordinary folk of Azeroth. 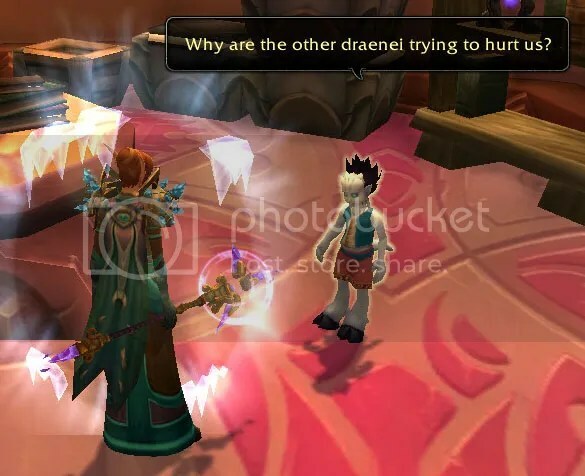 Every time I play through that scenario with another character, I can’t help but think, what was Kaprikka’s experience with this event — the experience of an ordinary Draenei citizen? — show that the devs put at least a little bit of thought into how this event would affect the ordinary people of the city. But that’s also another thing that makes it hard to think about logging into an unchanged, unaffected Exodar, with a Velen who is still a pillar of the Light. When I played through the scenario again last night with my Blood Elf Mage, Kaelinda, it was even more harrowing than it has been for my other characters. I imagined Kaelinda remembering her visit there, in Human disguise, shortly before the Cataclysm, and being even more deeply horrified than my other characters by the fel destruction taking place. I imagined her searching for the face of her friend, Kaprikka, among the crowd when she first arrived at Velen’s bubble in the Vault of Light and becoming increasingly desperate as she didn’t find Kaprikka while looking for Terrified Exodar Citizens to rescue. I imagined that she caught a glimpse of Kaprikka running to safety after she had finished collapsing the Legion portals, but that she couldn’t stay because Velen took off toward the Seat of the Naaru. And even though what I actually did in-game was use Khadgar’s Beacon to teleport back to New Dalaran as soon as the scenario was over, if I were to write this event up as an RP story, Kaelinda would go back to the Vault of Light to talk to Kaprikka before she returned to New Dalaran. For Draenei who have been around as long as Velen — or who are first- or second-generation children of the exodus — the attack of the Legion on the Exodar on Azeroth is probably just “oh no, not this again…” For Kaprikka, though, who is only 200 – 250 years old — born on Draenor, in Farahlon — this is only the second time that she has experienced this kind of thing… and if she’s honest with herself, in only a decade, she hasn’t completely recovered from the events that turned Draenor into Outland. And because she was in Farahlon, away from the worst of the rampage of the Orcs, the Legion’s attack on the Exodar on Azeroth is a more traumatic experience for her than Kael’thas’ Blood Elves’ attack on the Exodar that led to its flight to Azeroth. My Little Talbuk: Sisterhood is Magic! I can just imagine Dornaa or Salandria begging their Childrens’ Week patron, Oh please, please will you get one of those for me, please! When I thought about drawing little girls playing with ponies, though, the two great pairs of sisters that Warlords introduced to us immediately came to mind. Draka and her more reckless sister, Lokra, make a subtle foil to Durotan and his more reckless brother, Ga’nar, in the Frostfire Ridge storyline. Like Ga’nar, Lokra is headstrong and bloodthirsty, but she is also able to be reasonable and temperate. Where Durotan frowns at his brother, Draka is proud of her sister. The way Yrel describes her older sister, Samaraa, it sounds to me like Samaraa was much older — perhaps even enough older to have been born on a previous world where the Draenei temporarily sheltered — and that their parents may have perished while Yrel was still a child. I am a child of the ’80s, and I have fond memories of my mother teaching me to braid hair using the tails of my G1 My Little Ponies. — but her shirt needed to be bright construction zone orange.